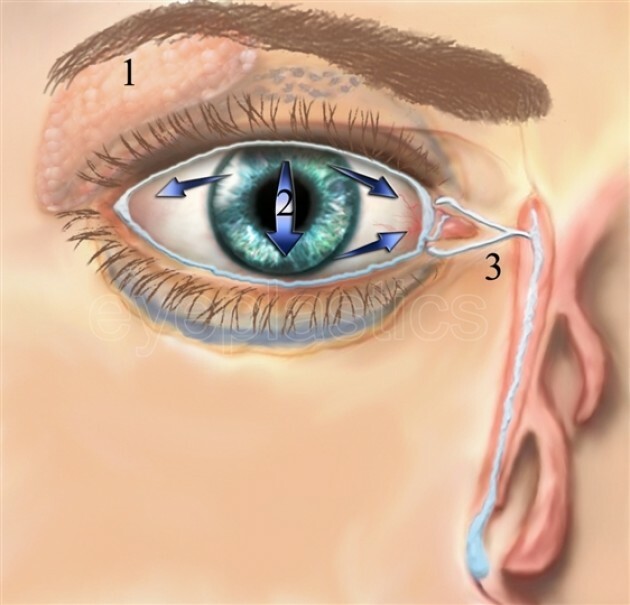 Canalicular lacerations are breaks (interruptions) in the normal tear duct drainage system. If not repaired promptly, tearing will usually result. 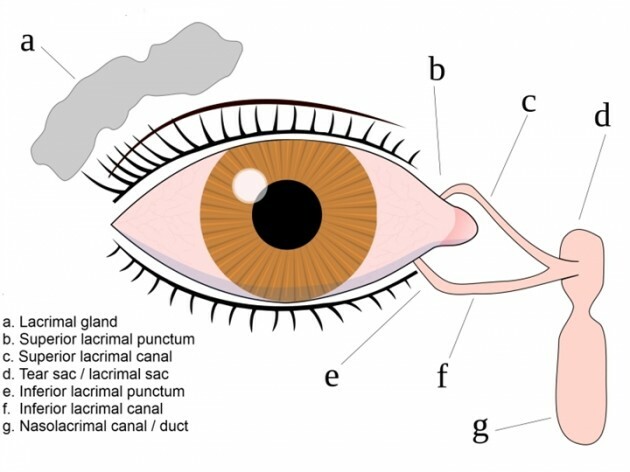 This systems originates with the puncta (there is one in both the upper and the lower eyelid) and is a conduit for tears to travel from the eyelid through the nasolacrimal sac into the nose. 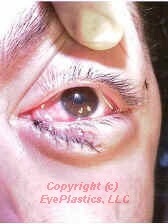 Tension, from trauma such as a blow from the fist, can result in an eyelid laceration which involves the canalicular system. 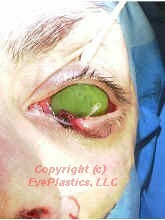 Repair requires re-approximation of the eyelid as well as re-approximation of the conduit; this is best achieved with a stent such as with silastic and fine sutures such as 6,7, or 8-0 vicryls.. There are several different means to repair such an injury. Placement of a stent (silastic tubing) helps maintain proper alignment of the conduit and prevent stricture after the repair. This places places a silicone stent in both the traumatized (lacerated) canalicular system as well as the normal. One disadvantage of this technique is the potential damage to the "good" canalicular system. This places places a silicone stent ONLY in the traumatized (lacerated) canalicular system and thus avoids potential damage to the "good" canalicular system. A mini-Monoka or Monoka monocanalicular stent is typically used. These three photos show a canalicular laceration and its repair with a Monoka monocanalicular stent. First the punctum is dilated (enlarged). 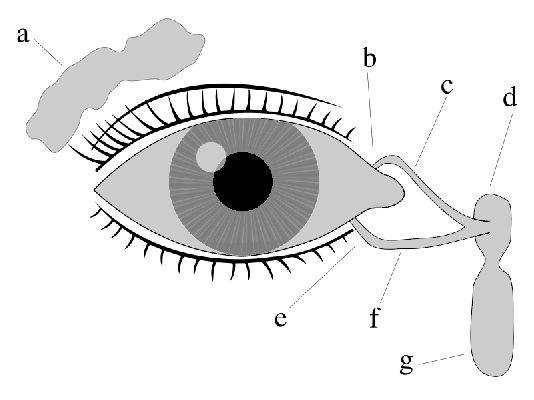 Next the medial (portion closest to the nose) cut end of the canalicular system is identified (this usually requires either high-powered magnifying loupes or an operating microscope). The stent is then placed through the punctum, through the medial cut end of the canalicular laceration, and retrieved from the nose; if a mini-Monoka is used, no retrieval is performed. 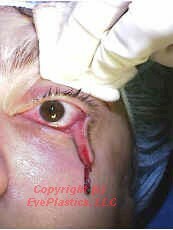 The laceration is then reapproximated with fine sutures. This is a type of monocanalicular stent that facilitates repair. 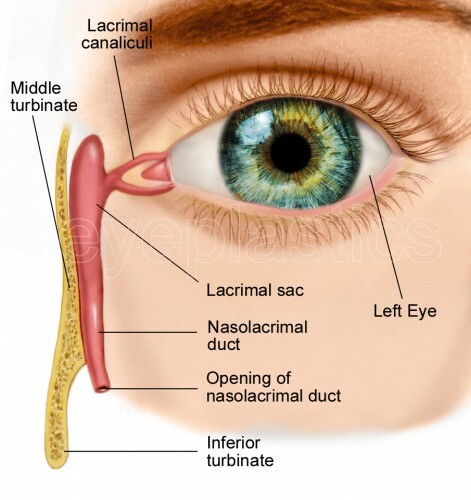 Following dilation and preliminary probing of lacrimal ducts, the Ritleng Probe (S1-1460u) is introduced into the canaliculus and nasolacrimal duct until contact is made with the nasal fossa floor. 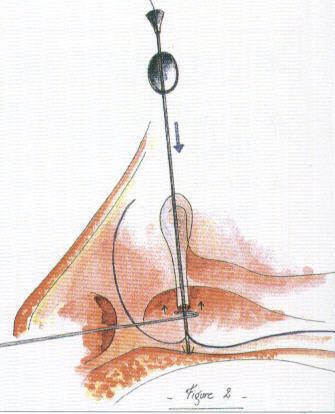 The probe is pulled back slightly (1 cm) to facilitate the introduction of the prolene thread-guide into the nasal cavity. 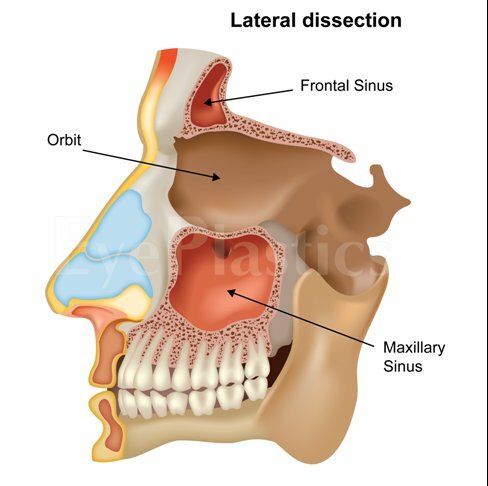 directing the prolene towards the front of the nasal cavity. The prolene is threaded through the probe to obtain a large loop which spreads out in the nasal cavity making it easy to locate. 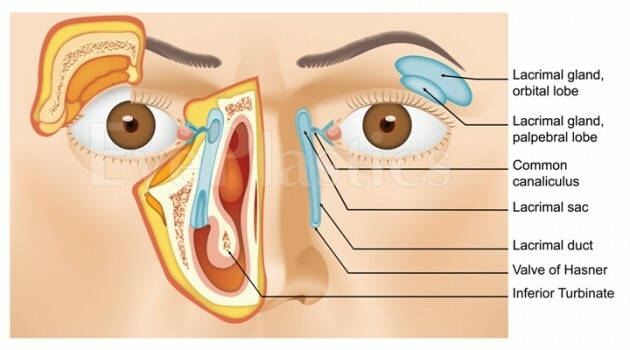 Retrieval of the blue prolene is easy when it appears in the anterior portion of the nose. The probe is introduced until contact is made with the nasal fossa floor. 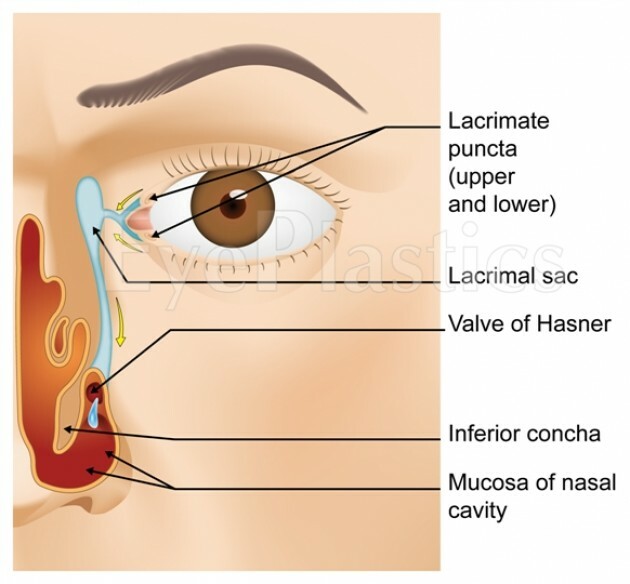 Metal-to-metal contact is made using the Ritleng Hook (S2-1480u) high up in the inferior meatus near the exit of the nasolacrimal duct. The probe is then rotated 180 degrees while keeping the metal-to-metal contact with the hook thus orienting its inferior opening towards the back. The hook should be above the probe's opening and the prolene. This will enable the hook to catch the prolene loop when removing from the nose. 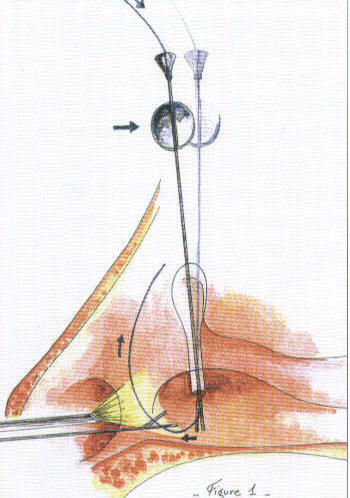 The probe is slowly backed out of the inferior meatus and as soon as the metal-to-metal contact between the probe and the hook is lost, the hook catches the prolene loop and is carefully removed from the nose. The probe is removed from the canaliculus and detached from the stent by sliding the thinner light blue portion of the prolene out through the probe's slit. The prolene thread-guide is pulled out the nose along with the attached silicone tubing. This same technique is used to intubate the second canaliculus in the case of a bicanaliqilar intubation. In the case of a monocanalicular intubation, the punctal plug at the other end of the silicone tubing is seated in the punctum using a punctal plug dilator inserter (S1-3090u). This allows intubation (stent placement) of the abnormal canalicular system and the normal system without entering the nose. One disadvantage of this technique is the potential damage to the "good" canalicular system. A Goldberg Bicanalicular Cerlage is used for stenting the upper canalicular system system for reconstruction, truama, and chronic stensosis of the upper system. Loft HJ.Wobig JL. Dailey RA. The bubble test: an atraumatic method for canalicular laceration repair. 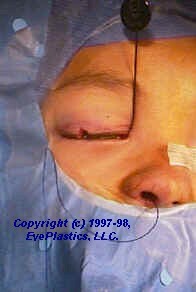 Ophthalmic Piastic ann Reconstructive Surg 1996;12:61-64. McLeish WM Bowman B, Anderson RL The pigtail probe protected by silicone intubation a combined approach to cana icu ar reconstruction. 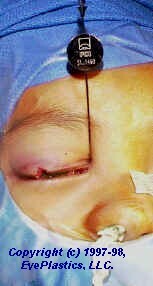 Ophthalmic Surg 1992;23:281-283.